The dictionaries may be accessed either via the Help menu in APSquery, or independently via the All Programs APS Menu. This is a new capability and is subject to rapid revision. Just click on this link: APSdictSetup.zip (830KB) to commence download. Do you need some Word Processing dictionaries? If you are looking for a dictionary of about 23,600 botanical names targetting Australian Native Plants, look no further. Can you correctly spell Passiflora cinnabarina? If you can't, then don't get disheartened, because help is at hand. Remembering the botanical names of thousands of plants is very difficult. Getting the spelling correct is almost impossible. A chance comment some years ago in an on-line Native Gardening magazine prompted me to further develop an idea I had. Why not have a dictionary of native botanical names that works with Microsoft Word or other word processors? It would be a great help for She, the gardener, so it started with about 5000 words. A few months later, I had available a dictionary containing about 17,000 words specifically relating to botanical names of Australian native flora. It was incrementally developed since then, eventually containing about 23,600 genera and species names. After a hiatus of about 3 years, I've released a completely regenerated Edition 14. It is now up to Edition 16 with separate ANSI and Unicode formats to suit a wider range of Word Processors. Many of the obscure entries have been eliminated, leaving a new dictionary with a total of about 21,000 families, genera and species. As a result, it should have far fewer questionable entries. Update Entries Size Description of Dictionary Contents. AuGenus.Dic 13/December/2011 5610 63KB Dictionary of Australian Native flora genera. AuSpecies.Dic 30/June/2009 14974 175KB Dictionary of Australian Native flora species. which may not work with some word processors. AuSpecies1.Dic 30/June/2009 5358 63KB Dictionary containing species "a*" to "f*". Suitable for word processors with 64KB dictionary file limit! AuSpecies2.Dic 30/June/2009 4364 51KB Dictionary containing species "g*" to "o*". AuSpecies3.Dic 30/June/2009 5252 62KB Dictionary containing species "p*" to "z*". AuFamilies.Dic 13/December/2011 516 8KB Dictionary containing Australian Native flora families. Families2.Dic 7/May/2003 275 5KB Dictionary containing non-Australian flora family names. Edition 16.0 (13/December/2011) is free here for you to download, just click on this link: AuNatives.zip (132KB) to commence download. * E16.0 contains minor revisions, mainly due to processing changes for names not current. * The zipped file includes a brief description (Install.txt) of the dictionaries and how to install them. For those requiring UniCode versions (e.g. Office2007 or Office2010) the following files are available. Since these modern word processors do not have the 64KB limit, only 3 files are required. AuGenusUC.Dic 13/December/2011 5610 126KB UniCode Dictionary of Australian Native flora genera. AuSpeciesUC.Dic 13/April/2010 14980 349KB UniCode Dictionary of Australian Native flora species. AuFamiliesUC.Dic 13/December/2011 516 15KB UniCode Dictionary containing Australian Native flora families. Click on this link: AuNativesUC.zip (93KB) to commence download. Follow your Word Processor help file for adding custom dictionaries. Acknowledgement: The botanical genera, species and family names have been primarily derived from databases accessible via the Australian National Botanic Gardens (ANBG) website, and where conflicting spellings exist, the ANBG spelling is used. If you notice any omissions or errors, please email me and I will see what I can do. If you wish to remain with the old version, (Edition 13.0; 07/FEBRUARY/2006) click on this link: Natives.zip (108KB) to commence download. 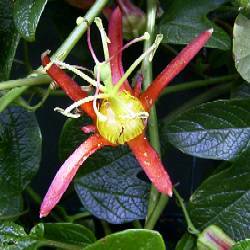 And just what is Passiflora cinnabarina? Its common name is Red Passionflower. It is a vigorous climber with an unusual flower about 8cm across, ideally suited for trellis and open fences. Now Available - a cross reference table showing the genus/family association for over 5200 Australian Native Plant genera. This table was developed to improve the performance of my free Australian Native Plants Selector, but can also be used independently if you only want a table of association. It is an alphabetically arranged list of genera with TAB-delimited associated family. It can be easily edited or processed to suit your own requirements, such as finding a list of all genera in each family or extracting and compacting all families. If printed as a genus/family lookup table it will produce a document of approximately 80 pages (12pt Courier New). Edition 8.0 (03/April/2016) is free here for you to download, just click on this link: GenusFam.zip (34KB) to commence download. DISCLAIMER: Internode, as my Internet Service Provider, is not responsible for the maintenance or content of these pages.